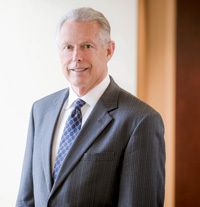 University Hospitals honored Eugene (Gene) Kratus, Esq., Partner, Weston Hurd LLP, with the 2015 Distinguished Advisor Award at the Diamond Advisory Group 10-Year Celebration and Annual Meeting, held in April at the Terrace Club at Progressive Field. Thomas F. Zenty III, Chief Executive Officer, University Hospitals, presented Mr. Kratus with the Distinguished Advisor Award for his role in helping individuals and families create meaningful legacies at UH. As a member of the UH Diamond Advisory Group, Mr. Kratus has played a major role in helping UH supporters achieve their philanthropic and financial goals. Most recently, he helped UH benefactor and world traveler Roe Green create a lasting legacy at University Hospitals through her generous gift of $5 million in support of the newly named Roe Green Center for Travel Medicine. One of the first of its kind in the country, the center serves about 4,500 travelers each year through clinics at UH Case Medical Center, UH Chagrin Highlands Health Center and UH Westlake Health Center.